City Of Tustin Parks & Recreation Dept. For years we have served as volunteers at the City of Tustin's Annual Easter Egg Hunt. Thousands of children and their families attend this free community event every year. Lions set up and operate several game booths for small children. We are usually joined by Miss Tustin and her Court who help us to run the games and interact with the children. Every child that plays receives a prize. Gene Thomas was one of the Charter Members of the Tustin Host Lions Club, which was founded in 1948. Mr. Thomas was very active in Tustin community affairs and served on the Board of the old Tustin Union School District. He was passionate about the students of Tustin. In memory of Lion Gene, THLC formed the Gene Thomas Memorial Scholarship program, where one $500 scholarship is given to a student from each of TUSD's four high schools. A committee spends time studying applications from students and choses recipients based on a well-rounded record, which includes academic achievement, involvement in school activities and service to the larger community. We organize and host a Holiday Boutique in conjunction with our City of Tustin Christmas Tree Lighting Ceremony each December. Each year, Tustin Host Lions Club proudly sponsors the Lions International Peace Poster Contest in our local middle schools. 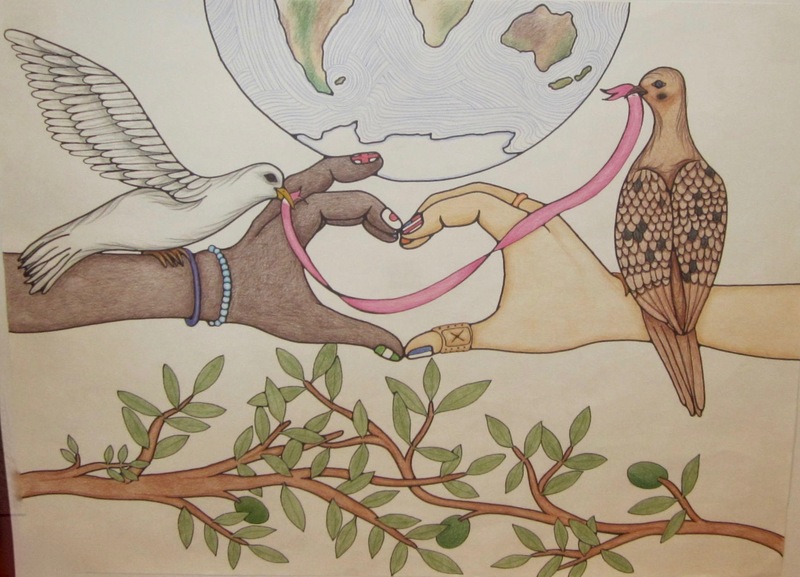 This art contest for kids encourages young people worldwide to express their visions of peace. For more than 25 years, millions of children from nearly 100 countries have participated in the contest. The poster pictured above was created by Tustin student Olivia Chung, from Orchard Hills Middle School. Olivia's poster was awarded the Runner Up Medal for our Lions Multiple District 4, state of California. The Peace Poster contest is one of our favorite projects! Click here for a great video! Lions have a long history of supporting The City of Hope. We truly care about the efforts to find a cure for cancer and other life threatening diseases, and we appreciate the loving and caring way that the entire staff at COH shares with their patients and families. At Tustin Host Lions Club we start every meeting with a City Of Hope Prayer and take a collection. We make an annual donation toward the Lions Family Center on campus. You can read more about this wonderful center here. Tustin Host Lions Club has been a long time supporter of The Blind Children's Learning Center, located right here in our Tustin Community. For more than 50 years, children who are blind, deaf-blind, and visually impaired have received specialized training to maximize their full potential and meet meaningful goals and objectives at BCLC. Parents receive support and encouragement during each and every step of their child's journey toward independence at the Center. Click here for a video about Blind Children's Learning Center. For close to 25 years our club has supported the Tustin Police Departments Santa Cop Program. This is a wonderful and much needed program that provides gifts for those families living in Tustin with limited resources. Without this program these families would not be able to provide presents for their children. Each year our club members collect unwrapped toys for donating and we always enjoy presenting our donation to Tustin PD at a General Meeting during the holidays. Since our charter back in 1948 Tustin Lions have been gathering used eyeglasses in our community to process them and provide them to those most in need. We have collection boxes spread about town where anyone can drop off their used eyeglasses for us to recycle. We collect the glasses, count and package them, then send them to recycling centers, such as LCI's Recycle For Sight centers or CLFIS where they are cleaned & cataloged by their prescription strength and sent to vision clinics and mission distributions around the world. By recycling your used eyeglasses you are improving the quality of life for less fortunate people who receive this gift of sight. The New Horizons Program offered by YMCA of Orange County is a program for adults with developmental disabilities and special needs ages 18 and up. The program provides safe and supervised recreational outings in the community that offer social interaction, skill building, and life-long friendships. Tustin Lions enjoy serving as community volunteers at the New Horizon Disability Dances four times per year. We help with set up, decorations, check-in and chaperoning. Tustin Lions Club sponsors one student from each of our local high schools to compete in our CA Lions MD4 Student Speakers Contest. For the 79th consecutive year, the Lions Clubs of California will hold speech contests in local communities beginning in February 2016. Over $103,500.00 will be paid out in scholarships to the winning students. Participating students must write their own speech on the subject given. Once a year our club hosts a free vision screening conducted by the California Lions Friends In Sight Group. We coordinate the date, secure the location, publicize and provide many volunteers, including eye care professionals in our community. Free vision screenings and used prescription eyeglasses are given during the day of the event. Over the last 3 years we have been able to meet the eyecare needs of more than 1,200 individuals in our community!